As you walk along the entry sidewalk towards the Home Economics Building, you will see this tree on the left. In general, maple leaves are easy to recognize because they are opposite on the twig and have palmate veins. Silver maple leaves have jagged margins with small teeth along the lobes. In the spring, silver maple is one of the first trees to bloom. Its winged fruits often have one seed of the pair much smaller than the other. In the wild, silver maple trees are typically seen only in wet areas, such as lowlands along large rivers. However, it is a commonly planted street tree, so it is very likely to be encountered by city dwellers. 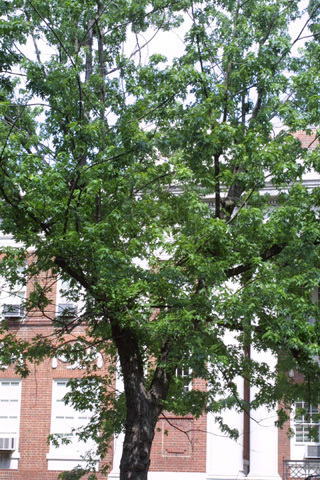 This tree is described on p. 84 of The Trees of Vanderbilt. This organism is a living specimen that is part of the  Vanderbilt University Arboretum  with the local identifier 1-7. Remarks: Described in the 1994 Trees of Vanderbilt p. 84.